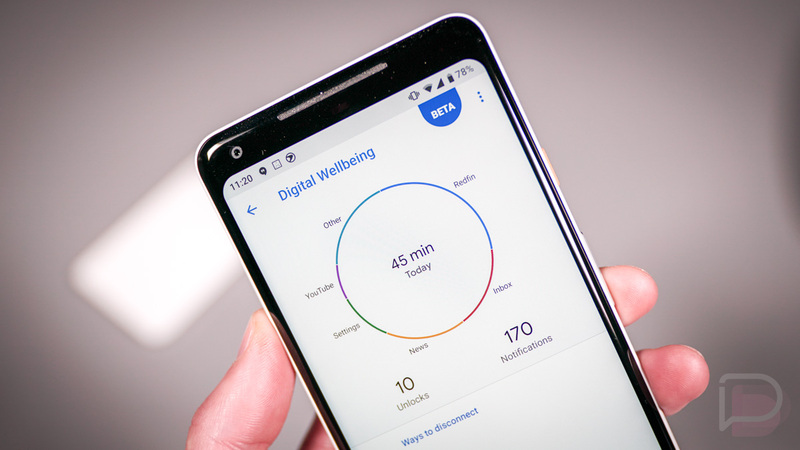 Video: Google’s Digital Wellbeing First Look! If you own a Pixel or Pixel 2 and it’s already running Android Pie, you can test out Google’s Digital Wellbeing software. It’s currently in beta and you have to sign-up for it before being able to install, but yeah, it is ready for the first time. RELATED: Google added an app shortcut and Quick Settings toggle! It’s a new software suite from Google that does a couple of things. First, it shows you just how much you use your phone and which apps you use the most on a daily and hourly basis. From there, after being shocked and disgusted at your life choices, it’ll help you disconnect more by setting timers on apps and forcing you to put your phone down at night with a Wind Down feature. It’ll also give you quick access to Android’s Do Not Disturb and notification controls to better limit your life interruptions. It’s actually a pretty slick set of options that you can adjust on your phone to help you unplug a little bit more. I’m certainly going to keep some of it active going forward. We took it for a spin after getting it installed on a Pixel 2 XL last night and then recorded this video to show you just how it works and some of the features you’ll want to adjust.